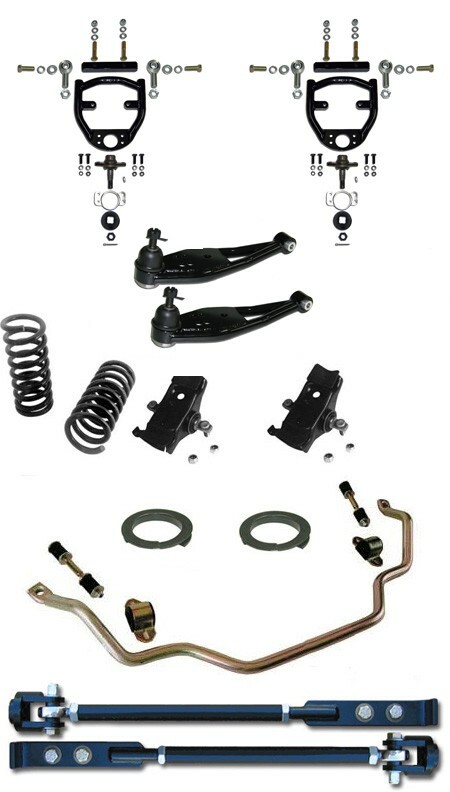 Rebuild your 65-66 V8 Mustangs front suspension with this money saving kit! Fits 65-66 V8 cars only. Shortened arm and angled ball joint plate increases camber gain. Tubular design makes for a lightweight, rigid structure. Teflon/Kevlar race lined pivots provide bind free movement and long service life without any cleaning, greasing or maintenance. Moog ball joints, bearings and all nuts and bolts are replaceable 'off the shelf' components making these arms easily serviceable. Durable powder coated high gloss black finish. UCA accepts stock spring perch or rollerized perches. No need to drill or weld and re-drill new mounting holes as these are compatible with stock, 1" drop or 1-3/4" drop holes. Includes CNC laser cut steel plate 'Shelby Drop' lowering template (#STUCALDJ6566 or #STUCALDJ6770 depending on year arms purchased). Sold as a pair and shipped fully assembled with detailed installation and alignment instructions. Monoball bearing with PTFE/Self lubricating lining replaces factory rubber bushing which eliminates deflection yet allows for bind free rotation. Screw-in ball joints and bearings are replaceable 'off the shelf' components making these arms easily serviceable and able to last a lifetime. Accepts stock strut rod or our Adjustable Strut Rods. Shipped fully assembled with detailed instructions. Choose from Stock (# SCD-C5ZZ-5310-B), GT (# SCD-C5ZZ-5310-E) or Performance (#SCD-C5ZZ-5310-P). Choose from rubber (# SCD-C4DZ-5415-AR), polyurethane (# SCD-C4DZ-5415-UR) or 1" thick polyurethane (# SCD-C4DZ-5415-URT). Features quality stamped steel construction, bushings, nuts & anti-squeak coil protector pads. Choose from 1" (# SCD-S1MS-5482-A) or 1-1/8" (# SCD-S1MS-5482-B) - Our high quality sway bars are made from high carbon steel with hot forged ends and cadmium plating. Kit contains black polyurethane mount bushings andlinks with polyurethane grommets. Our Adjustable Strut Rods eliminate the stock rubber bushings which are replaced with a high quality, high strength Teflon & Kevlar impregnated rod end mounted in a custom designed billet steel bracket. This eliminates the stock bushings and binding problems associated with the stock strut, while allowing bind-free movement throughout the suspensions full range of motion. Quickly & easily set 3-5 degrees of positive Caster on most applications! Brand new spring perches are purchased, then modified with 2 sealed roller bearings that replace the stock rubber design for a bind free operation. Sealed bearings and bearing carrier requires no lubrication!